Pendants - Connard & Son Ltd. This is a beautiful yet simple design, the large peridot is cut in the pear shaped, this is held in a very neat 3 claw setting in 18ct yellow gold. The peridot is suspended from the point of a diamond also the in the same pair shaped cut. the diamond is held in a setting of the same style except it is is 18ct white gold. For neatness the mounting of the diamond also forms the loop where the necklet can be hidden behind. 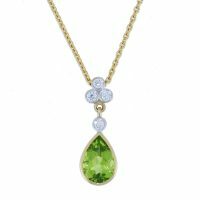 the Peridot and diamond although are set very close together, they are free moving which means they sit better on the neckline due to having freedom to move. the necklet is an 18ct white gold faceted trace necklet which can easily slide behind the back of the diamond. This is a lovely and classical pendant design. 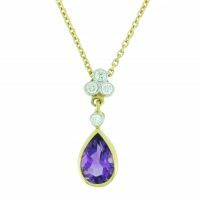 The main feature is the pear shaped (pendeloque cut) Amethyst which has a single brilliant cut diamond above it. This is freely suspended from a trefoil of 3 brilliant cut diamonds. The mounting of the amethyst is in a smooth rub over 18ct yellow gold mount and the diamonds are mounted in the same smooth rub over 18ct white gold settings. The necklet passes neatly at the back of the mounting of the top diamonds, thus preventing the need for a loop. The necklet is our own 18ct yellow gold faceted trace necklet. We have 2 pendants in this unusual and striking shape, with with different gemstones in. This piece has the large citrine in a kite shaped cut with a briolette cut top. The briolette cut, has more facets than a traditionally cut stone, and all the different angles makes the stones catch the light with every turn. The Citrine is surrounded by straight lines of brilliant cut diamonds. The cluster is suspended by a matching cut in peridot that is a smaller stone than the cluster below it. The yellow and green contrast very well. The mounting of the pendant is all in 18cy yellow gold. 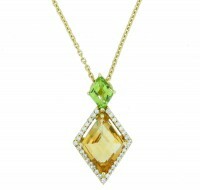 The necklet is neatly hidden at the back of the peridot, thus allowing a very stylish finish to the piece. The 18ct yellow gold necklet is our own faceted trace. 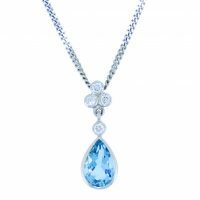 The main feature is the pear shaped (pendeloque cut) Aquamarine which has a single brilliant cut diamond above it. This is freely suspended from a trefoil of 3 brilliant cut diamonds. The mounting of the Aquamarine is in a smooth rub over 18ct white gold mount and the diamonds are mounted in the same smooth rub over 18ct white gold settings. The necklet passes neatly at the back of the mounting of the top diamonds, thus preventing the need for a loop. The necklet is our own 18ct white gold curb link necklet. 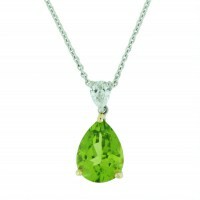 The main feature is the pear shaped (pendeloque cut) Peridot which has a single brilliant cut diamond above it. This is freely suspended from a trefoil of 3 brilliant cut diamonds. The mounting of the peridot is in a smooth rub over 18ct yellow gold mount and the diamonds are mounted in the same smooth rub over 18ct white gold settings. The necklet passes neatly at the back of the mounting of the top diamonds, thus preventing the need for a loop. The necklet is our own 18ct yellow gold faceted trace necklet. 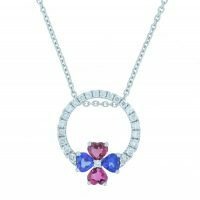 This piece has a quatrefoil cluster of 2 heart cut Pink tourmalines alternating wth 2 Heart cut Tanzanites at the bottom of the pendant, set in the centre where the points all meet is a single brilliant cut diamond. This cluster is at the bottom of a graduating circle of 22 brilliant cut diamonds all mounted in 18ct white gold neat claw settings. The necklet passes through the back of the top of the circle and is one of of our 18ct white gold faceted trace necklets.